I’m guessing you want your shed to last a long time. 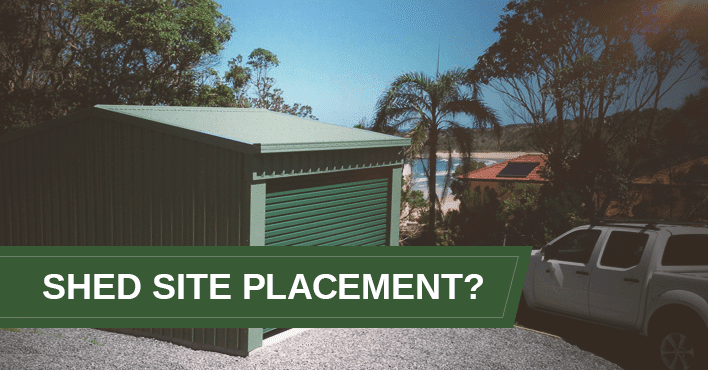 And if that’s the case, if you don’t choose the best site placement for your shed, you may be looking at the consequences for a long time to come! Turning circle: Be sure to position your shed with enough room for vehicles to easily enter the doorways. If you’re looking to store boats, caravans or trailers etc., then the turning circle has to be wider still. Slope: Concrete slabs and footings may cost more on steep slopes, and may affect ease of moving vehicles and other items in or out. Access angles: If the slab is level and the driveway up to the doors is steep (either up or down) the door height will need to be increased for clearance. If the change of angle (between the driveway and slab) is too great it may cause vehicles to scrape on the ground. This is especially important for vehicles with a low ground clearance. Access to property: This is particularly important when building your shed. Is there easy access for a crane, scissor lift, generator and room around the shed for scaffolding? A cramped or inaccessible shed site can create building headaches. When we get together with a client on the phone for a Free Shed Design and Quote Session, we always locate the intended site with the aid of Google Earth, and are able to help you choose the ideal site for your shed. The above 6 tips will help.